For angle measurement, HEIDENHAIN provides a large selection of encoders that cover the entire range of accuracy requirements. Angle encoders have an accuracy of better than ± 5" and a line count above 10000. These devices are used in applications such as NC rotary tables, swivel heads of machine tools, dividing apparatus, high-precision angle measuring tables, precision devices in angular metrology, antennae and telescopes. 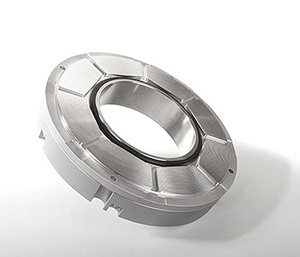 HEIDENHAIN rotary encoders serve as measuring sensors for rotary motion, angular velocity and also, when used in conjunction with mechanical measuring standards such as lead screws, for linear motion. Application areas include electrical motors, machine tools, printing machines, woodworking machines, textile machines, robots and handling devices, as well as various types of measuring, testing, and inspection devices. Absolute angle encoders and rotary encoders require no previous traverse to provide the current position value. Single turn encoders provide the current angular position value within one revolution, while multi-turn encoders can distinguish between revolutions. Absolute angle encoders and rotary encoders from HEIDENHAIN provide the position values over an EnDat, SSI, PROFIBUS-DP or other serial data interface. The EnDat PROFIBUS-DP bidirectional interfaces enable automatic configuration of the higher-level electronics and provide monitoring and diagnostic functions. With programmable rotary encoders, the user can adjust various encoder functions and parameters from a PC with provided software.